The morning walkers take walk at ease within the by lanes of Santa Cruz, west like Tagore road towards Madhu Park via Ramkrishna Temple complex or Derasar Road, via Main Avenue towards Arya Samaj. The common destination is park or public place scattered around the locality namely, Lions garden, Muktanand Park, Rotary Park, Vithal Nagar Temple Complex or Laxminarayan Temple Complex, which are all easily accessible from all parts of neighbourhood. There is some sense of familiarity among all the morning goers irrespective of the morning rituals. The familiarity is perhaps two generation deep among many of those who confirm their presence at that hour. This affirms the socially identifiable neighbourhood along with the some sense of pride & privilege. The Santacruz- West is among few suburbs to have privilege of all the amenities at walking distance. The north bound street namely, Dattatrya road, Podar street, Tilak road sets an example of how public realm & private realm coexist at walk able distance. The Santacruz – West always had strong community identity with few recognizable community spaces like, Laxminarayan & Vithal Nagar temple complexes, the parks. The name of many public places & streets have changed but not able to take away its original association or its significance. As the morning sun shifts from its horizon, the belief seems to be contrived one as by lanes suddenly breaks with thick presence of innumerable activity. By noon the inner loop transformation blurs the boundaries of public realm & private realm beyond its recognition. The self affirmation of existence in quite neighbourhood is engulfed into gentrified and speculative place. However the last decade has witness the transformation that has happened through TDR regulation. This was perhaps the policy to allow development north bound with intention to decongest the inner core. The intention is to present here a case which seems to fall prey to the regulation, which needs to be analysed as post development case study. In that sense urbanity may or may not be romantic or nostalgic, but in real sense its constantly evolving process, acknowledges or negates the development pressure that exert on its form. This may perhaps serves as model for the new policy that may require to be implemented. The first case is expansion of Podar School Complex. The FSI regulation may have been relaxed for institution but not at the cost of architecture heritage building. It happened to our disbelief that Podar School Tower Building was pulled down and made the way for high rise block. The morning 7.00 clock tower beat (could have been heritage structure) reminder of Podar School Tower is perhaps the far-flung memory to the resident & one who have attended that school. The adjacent two blocks were amalgamated to form a long building block where inner courtyard was done away with. The resultant type is reminiscent to narcissistic imagination of what an institution building could be. The second victims of the regulation were buildings between Linking road & S. V Road especially Tagore Road & Derasar Road. The case represents the classical dilemma of what street section should be. The TDR regulation should have been proportion to the width of the street. The Tagore road has almost all the building developed without any provision of set backs to widen the street. The height regulations outside the flying zone has blanket rule. Thus the blocks on S.V Road, Linking Road or Inner lane has different width of street but same height. The symptom of this staged invasion of TDR development is visible in the pattern of socializing. The soft street corners for socializing are hard edge for enterprising, the inner lanes for community events/ sports are transformed into parking lots. The most effected area as shown in the sketch are the inner loop namely Green Street, Saraswati Road, Derasar Road, Tagore Road. The narrative has yet to reach its climax as one examines the possibility of development in next five year. The Hindu Stree Mandal for its Educational Expansion Project, the Hansraj Wadi, the Laxminarayan Temple are among the most sought out/ contested/ threatened place for development as each of them is larger lot compared to the neighbouring lots. The North Bound areas like Khira nagar, Shashtri nagar, Best Depot have larger contesting corporate bodies for their development. Each of them is targeted as potential mall for there presence on main arterial road. If that is the imagined reality of future than Santacruz may set branded model for highest Mall Density. The visual survey shows the location & approximate proportion of contested lots across the area. 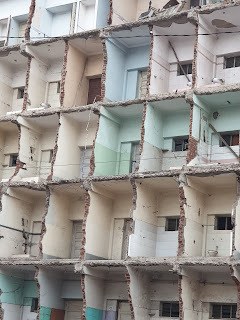 The further pressure on this locality is evident in the formation of new loop or ring outside namely, Bandh Road, Ramkrishna Mission Road, Phirozshah Mehta Road, without accounting for the impact of elevated metro rail & the station. The density of inner core is stressful on existing infrastructure without much exaggeration. In addition to that the mass scale digging the storm water drain and connecting all of them only have worsen the situation as all the streets started flooding simultaneously. The peripheral loop with commercial potential can be foreseen as holocaust from point of view accessibility. The lots between core & peripheral are protected by CRZ regulation. The Saraswat colony, Vithal Nagar RBI quarters have their own open space & Muktanand Park, Rotary Park, Temple complex in their vicinity. It has some meritorious value for its built v/s inbuilt proportion. The new buzz of CRZ relaxation is extremely fearful if one visualize through the same pattern of development. The Wellington Gymkhana neighbourhood has already succumbed to this pattern & almost seems to be amalgamated to the inner loop without any sense of order or hierarchy. The centre of main loops is gaothan area near station. These areas have already begun to show new pattern of larger development by amalgamation of small lots for commercial/ mall. The Sukhanand wadi on Phiroze Shah Mehta has already been transformed into a mall with existing apartment all around. It seems to be an apparent move towards activity gentrification to the residential areas. These arguments bring the question that “does a civic administration exist merely for sake of enabling people to fulfil the needs of daily life as cheaply as possible? The process & economic cycles always creates perennial disequilibrium in terms of new commercial districts v/s social differentiation. Needless to say that development is as much reality as inevitable phenomenon and Santacruz is no exceptional. The issue here is that development policy shall be substantiated with the comprehensive study with in-depth projection and shall not be a trajectory of urban will. Although it’s mere first impression that author has documented but the further analysis may reveal irreparable insight in to the nature of emerging reality which may not promise anything beyond the high real estate value. The recent duties of post work has expanded into helping Miroy in his homework. The knowing subjects & teaching in adpoted style was difficult task than i thought. It has its own fun, sometimes frustration & sometime quite evolving. The recent incidence was hillarious as much as serious. The task was to make him understand the difference between joint family & nuclear family. The advantage of joint family against the nuclear family and to know the basic difference in structure of family. I started with asking question on joint family, i explained him the way joint family lives. Everything went very well however to my surprise, when i asked about nuclear family, he promplty disagreed with me on its compostion. Instead he explained: "if you, deepa & i decide to live seperately that is nuclear family".
" I thought that is new family compostion for fatafat generation... any comments"